Welcome back to the Around the Stadiums coverage for the 2017 Season, where we bring you the January Premier Challenge summary of results from around Australia. This edition will look at results from January 2017. With the metagame settling down a little after a hectic opening month, players pressed on for championship points in most states with a bit more knowledge and a bit less guesswork. Attendance has been increasing around the country, making the fields deeper than ever. Box Hill even reached a total of 57 players on January 28th, a record for Australian Premier Challenges. South Australia held two grassroots events, although they did not award points. Hopefully, this progresses through the season towards CP awarding full Premier events. 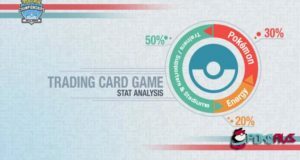 While the usage statistics changed somewhat, we saw a group of consistent players emerge as they showed their advanced understanding of the format. We hope to see this trend continue throughout the season heading into to the Melbourne International Championships and beyond. 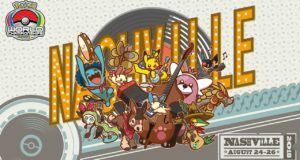 To be sure you don’t miss your next chance to compete, you can keep up-to-date with the times and locations of all of Australia’s 2017 season Premier Challenges on Pokémon Australia’s events calendar. If you’re confused by any terms you see here, make sure to check out our Glossary of Terms to help get you up to speed. Lucas Gofton took out Tasmania’s Premier Challenge, defeating local superpower Brendan Webb in the final. Brendan will nonetheless appreciate the Championship Points as he quests for a World Championship invitation. This PC marked the first of three tournaments in three weeks for Tasmania, as they have another Premier Challenge followed by a Midseason Showdown scheduled over the next two weeks. Reigning Perth Regional Champion Alister Sandover took out his second Premier Challenge on January 21st. He defeated Philam Vu in the finals. Serial top cutters Kevin Pal-ing and Benjamin O’Neill rounded out the top 4. The attendance of 25 demonstrates the growth of the PC scene in Perth and in Australia as a whole for the 2017 season. Brisbane opened up the year’s events with a Premier Challenge on the first Saturday of the year. Damon Murdoch improved from his top 4 in December, but couldn’t take out the tournament. Luke Milligan defeated him in a closely fought final, which was streamed on facebook by Phil Nguyen. Numerous other familiar faces filled out rest of the top cut, including Matthew Burris, Mustafaa Olomi and Tony Nguyen. Victoria once again enjoyed multiple Premier Challenges this month. On January 8th we saw James Farrugia and Joshua Callister battle in the finals, with James taking the victory. Chris Kan’s top 4 follows up his victory in the final PC of 2016 to show his good form. Bailey Owen was rewarded for not going home early by winning the Box Hill PC on January 28th, defeating James Farrugia in the final and going undefeated in sets across the day. James has also had consistently good results so far this season. 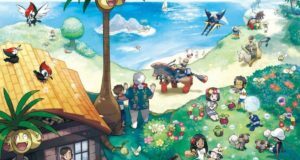 Ryan Hercus made it all the way up to top 4 with a Palossand and Smeargle combination in his team, guiding it remarkably through a best of three setting. In Adelaide’s first event of 2017, Ben Madigan proved too strong for Wilson Quan. Wilson earned himself another runner-up finish a fortnight later, with Joshua Ware winning in Adelaide’s second grassroots event of 2017. Ben now has a 1st, 2nd and top 4 in his three 2017 season events so far, and so may be one to watch at the big events of the season. Ian Carter continued the trend of Adelaide players using code names in finishing top 4 at the January 22nd event. Jimmy Chen bolstered his strong start to the 2017 season by taking out the Newcastle PC, defeating Mitch Kendrick in the final. This keeps him in the top group of APAC players by Championship Points, and well on the way to an invitation to the World Championships in Anaheim later this year. Manish Kumar returned to top cut again, this time without Eevee. Daniel Walker showed he still has what it takes to secure success by winning at Bondi Junction, defeating Arkington Owen in the final. Jay Callaghan made it two top 4’s in two weeks, while Martin Larumbe’s two top 8 finishes this month help him to remain in Australia’s top 12 by Championship Points. APAC Regional standings viewable here. Sam Pandelis (ZeldaVGC), Jimmy Chen, and Alex Poole continue to take the top 3 positions thanks to their performances in London in December. Sam and Jimmy also currently sit in the top 8 within the APAC region. With points due soon from Tasmania (who had their PC late in the month), Brendan Webb and Lochiel Cameron should soon move up to overtake Alex, and will be poised for more points should they do well at Tasmania’s upcoming Midseason Showdown. 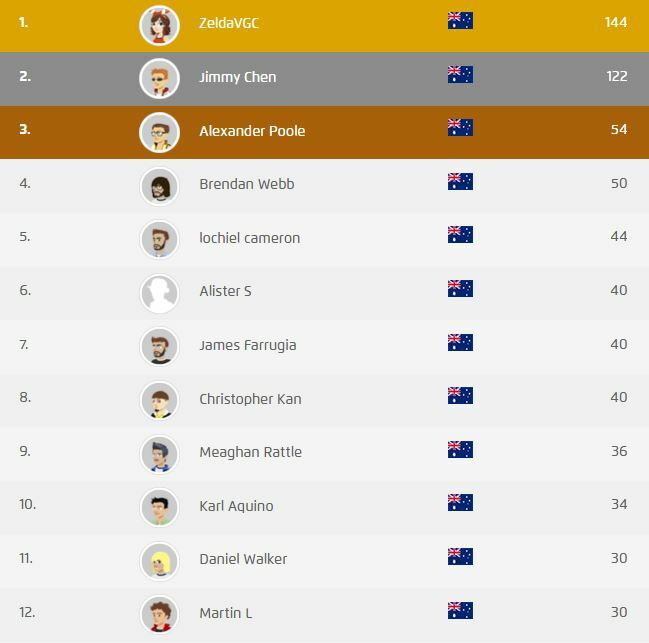 Alister’s scintillating form, which has seen him take out Perth’s last two Premier Challenges and EXP Gaming’s first online Grinder event, sits in fifth. Karl Aquino splits the Victorian trio of James, Christopher and Meaghan above him and the NSW duo of Daniel and Martin below him to round out the top 12. With the Melbourne International Championships just a month and a half away, players will need all the time they can get to hone their skills for the International stage. The best place to do that offline will be at local Premier Challenges, so we hope to see you there getting ready for a big three days of competition in March! Special thanks to those that helped get this article happening.